I'm sure names can be put to all the faces! Use the larger version to help. 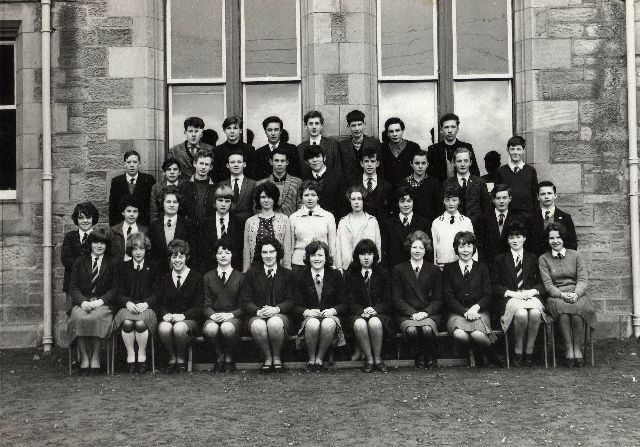 I was in this class till end of 2nd year (1964) before I moved to Musselburgh - can identify the following. There are faces I remeber that I cannot put names to and there may be a couple of mistakes. Anyone fill in the missing names ?? Back Row (left to right): George Swanson, Robert Palmowski, ?, Ronnie Harmon, Robbie Adam, Donald Ross, Andrew Robertson. Third Row: WIlliam Scobie, Leonard Christopher, Roy Ross, Kenneth Graham, David Sheare, Robert Biagi, Ian Macleod, Chalie Coward, George Muirden, Alastair Ross. Second Row: ?, Davine Sutherland, Margaret Urquhart, Edith Munro, ?, ?, Karen Mackenzie, ?, ?, Hamish Manson, Alan McLaughlin. Front Row: ?, Elizabeth(Jay) Anderson, Christine MacKinnon, Rosalind Fraser (my cousin), ?, Monica Mackay, ?, Aileen Logan, Catriona Sutherland, ?, Maree Zawinski. Matheson, Monica Mackay, Moira Fraser, Aileen Logan, Catriona Sutherland, Lesley Mackay, Mairi Zawinski. Just one question: Is this Margaret Urquhart who now plays and teaches double bass in Amsterdam (Mozart)? Hello everyone! What a handsome bunch! Came across this memory jerking photo completely by chance - were we really a single class? And people moan about the large sizes of today. Combined age 2100+ years? Joking apart, I have mislaid this snap of a past moment in time and it was lovely to see it again. If anyone is inclined, I would love to hear how life has treated you. I know that Catriona is no longer with us, which saddens me greatly. Look forward to hearing from you? Hi all! Great memories are flooding back after seeing this photo. I too would love to hear from anyone who has inclination. Glad I found this site. I am living in Italy with my husband of 42 years. Retired and enjoying life. We have 2 children and 3 grandchildren all of whom live in Scotland. Hello, does anyone remember Barbara Williamson? Born 1950 and attended Invergordon Academy, came from a large family with several brothers and sisters.